Home > Age Statistics > Who is the World's Oldest Living Person? Who was the oldest super-centenarian who has ever lived and who is currently the oldest living person is a subject that has long been open to debate. 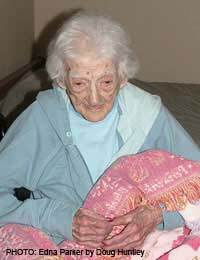 Among longevity researchers and those who study centenarians throughout history, there has generally been reached a consensus that the oldest person on record with verifiable documentation was Jeanne Calment. Jeanne was born Feb 21, 1875 and died Aug 4 1997 making her 122 years 164 days old on the day of her passing. But that is where consensus ends. Debate over who is currently the title holder of “World’s Oldest Living Person”, is hotly contested. First of all given that many of these “super-centenaries” live in outlying parts of the world, verifying the accuracy of their age claims is often difficult. Also given the advanced years of whomever holds claim to the title at any given time, it is an honour that can pass to the “second oldest person” at any moment. Still according to the Guinness Book of World Records, American Edna Parker is currently the “official” oldest living person. Edna was born on the 20th of April 1893 making her just about 115 as of the writing of this piece. Parker became “Number1”in August of 2007, when Japanese Yone Minagawa, 3 months and 16 days her senior passed on. Parker lives in a small community in Shelbyville, Indiana, and unlike Minagawa at the time of her death, Edna still can walk and finds herself in relatively good health. While the claim has not been “officially” verified, Edna may need to succeed her title to a Palestinian woman living in Israel who may very well be 5 years her senior! Mariam Amash, is an inhabitant of the mostly Arab town of Jisr az-Zarqa, in northern Israel. Israeli immigration papers document that Amash was born in 1888 making her 120 years old and a rival of Jean Calment’s. And according to her, she intends to surpass Calment’s 122-year-old milestone. Says Amash; “I am indeed yes the oldest person in the world. I eat, I drink, and I take showers. I hope to keep going for another 10 years." According to her relatives, who believe her claim, the Arab woman has 10 children, 120 grandchildren, 250 great-grandchildren, and 30 great-great-grandchildren. The spotlight shown on Amash when she applied for a new Israeli Identity Card, and Israeli authorities were shocked to see her birth date of 1881. But they issued the card based on a provided birth certificate issued by the Turks who ruled Palestine over a century ago. Amash is of Bedouin descent and she attributes her longevity to her diet that consists mostly of vegetables and Olive Oil “ I drink it [olive oil] by the glass” says Amash. The great-great grandmother says the younger generation drinks too much alcohol. She remains quite active for her age, and is very religious. She is a devout Muslim and has made five pilgrimages to Mecca, although the last one was in 1990. There is somewhat less debate over who is the centenarian that is the world’s oldest man. That “undisputed” title seems to belong to 115-year-old Hryhory Nestor, of Ukraine. His passport issued based on Austrian birth records, states he was born on March 15, 1891. He attributes his longevity to healthy living and also because he is the world’s oldest “eligible bachelor” and jokes that the fact he never married has probably contributed to his long life! Nestor still worked on the family farm until he retired at the age of 100. He is still surprisingly healthy, has a full head of hair on his head, and in addition to staying single he recommends a diet of milk, cheese and potatoes with an occasional shot of vodka. This is something that's always going to change and be a matter of contention. There are supposedly a number of Russians well over 100 years old, but whose births were never recorded, for example. I don't know that we'll ever have a definitive answer at any moment in time - what about those tribes by the Amazon, for instance? Some people there could well be very old. So while this is good and fun, it's best not to take it too seriously.